Tank setup: A large tank - at least 48" (120cm), with good circulation. Provide some cover around the rear and ends of the tank with some open swimming space at the front. Compatibility: Predatory, keep with larger fish. Feeding: Carnivore: live and dead meaty foods, young fish will take flake and pellets. 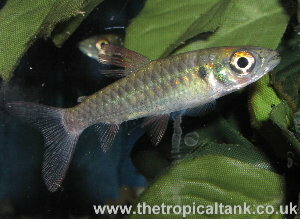 Breeding: Rare in aquaria, accomplished in very large tanks where eggs were scattered among plants. Comments: Use a tight fitting lid on the aquarium, as these fish may jump.